I have the itch to buy a new pinball. I am split between buying a Stern Star Trek Pro, Spider man, or POTC. Which one should I get. PM me if you know of a good deal. I would go SM pretty easy out of those. SM or ST, i just don't care for POTC personally. SM or ST whichever you are a bigger fan of theme wise. I personally prefer ST. 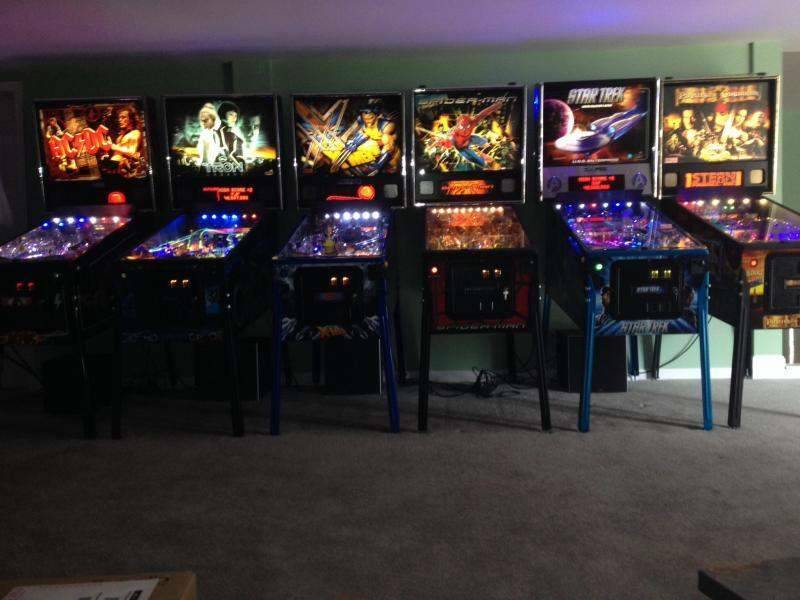 I have the itch to buy a new pinball. A new pinball? Then 2013 Star Trek is your only choice. The others aren't that new: 2006 Pirates and 2007 Spiderman. Spider-Man. Tried and true, code is done & fun. I have Pirates and Star Trek now, and owned Spider-Man for about four years before I traded it for something different. I'd take Spider-Man back in an instant, I definitely regret selling it. In my opinion, Spider-Man is the winner here. Pirates is fun too, but it can get boring a bit quickly. Pirates is the kind of game that I can't play over and over, but I like to come back to it from time to time. Star Trek is ok, but I feel like I'm having more fun when I play Spider-Man. The shots are more satisfying in Spider-Man, and the game makes me feel good about myself when I make shots (cool light and sound effects that are specific to certain shots). Star Trek has the warp ramp which is cool, but other than that I think Spider-Man is your best bet. I prefer ST to Spiderman, but I think both are better than POTC. The ship is a cool toy though, but it's too stop and go for my taste. The one thing that irks me about Spiderman is that kickout from the black suit/sandman shot into the pops. It just seems so awkward. Like they didn't want to make a subway or just have a 1-way ball gate with a little kick through into the pops. It's this giant piece of bent metal that just dumps the ball straight down onto the playfield. SM for sure, if you can find a good deal on one in Michigan. I didn't find POTC to be a keeper in my collection. SM either for that matter, but that was more about theme than gameplay. For ST, I just don't see much bang for the buck. I vote SM. I know I'm in the minority here, but I like POTC the best of the three. The ship is a blast. I like going for the Kracken when the ship is down. The theme is fun for the whole family. The game and toys have a W/B quality feel to them. I felt that way about BDK as well, although that game is not quite as fun as any of these. Yes, it's a stop and go game. But it works in this case, I think. SM is a lot similar to ST in layout, but seems like there is more toys and better code on SM at the moment. Do not pass up an XMLE or IM if you stumble on one, as they are my favorites at the moment, but PotC is really a great all around family friendly game and the ship is lots of fun mate. PS I also love AcDc and Tron. I know I'm in the minority but I like POTC then ST then SM.... SM just seems overrated imo. I voted ST, but if you really like the spiderman theme [I didn't] go with that first. I love the way it plays - just not the theme and callouts. POTC would come in last for me between these 3, but all are GREAT pins. Anything other than POTC. The game is slow and very stop and go. Just about every shot results in a pause. Spiderman has held up well and is a very fun AND FAST game.